This study confirms findings from other studies that typical picky eating is often a phase. It did not delve into the experience of the persistent picky eater or severity. “Commonly, health professionals tend to regard picky eating as a transient phase of the development of the preschool child. However, many parents of picky eaters seek medical help for their children’s pickiness, and express frustration with physicians for dismissing their concerns. We argue that indeed picky eating between the ages of 0 and 4 years may in general be considered as part of normal development. Perhaps parents would like concrete guidance around how to make mealtimes tolerable and help an anxious child learn to eat and accept a wider variety of foods? Or perhaps all they do need is reassurance and a few resources. This suggested ‘guideline’ will likely contribute to the trend of clinicians offering little more than, “He’ll grow out of it.” (The main obstacle I would argue is lack of training on even basic feeding information for most primary care providers and the lack of time with typical office visits.) The clinician following this ‘evidence based’ suggested guideline may feel that it is correct to ignore picky eating for three years. I don’t understand the logic behind waiting three years to ‘monitor for risk’ of persistent picky eating— isn’t it at three years by definition already persistent? For parents and children desperate for help, suffering through anxiety-ridden meals, decreased intake, gagging at the table, missing out on play-dates and camp, this is bad care. The study doesn’t help clinicians begin to tease out early risk factors (reflux, prematurity, allergies, sensory or oral-motor problems, autism spectrum diagnoses, medical conditions, tongue-tie, poor latch, worry about weight, counterproductive feeding…), and indeed as an observational study it wasn’t designed to. By offering an untested and unsupported guideline, clinicians are essentially advised in some cases to falsely reassure worried parents who need real help. Yes, parents are “frustrated,” often rightly so. Jenny and I have had many clients told—for years— not to worry, that the child would grow out of feeding challenges, extreme food aversions, food anxieties and selective eating. Research is a good thing, but too often, findings are overstated or conclusions are presented that are unwarranted by the data. This is why we strive to empower you, the parents, to become the best advocate for your child. 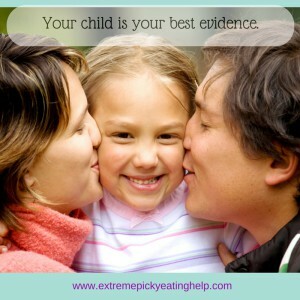 Your child is your best evidence. Find a clinician who will listen and become your partner. Unfortunately, this study doesn’t help clinicians become the partner parents and children deserve. *Roughly 30% lost to follow up by age six and only about 50% had complete data for all three phases of the study. For more information, check out Katja and Jenny’s book, Helping Your Child with Extreme Picky Eating, including information on why children struggle with eating, how to determine if you need professional help, what you can do to support your child with extreme picky eating at home, and how to find the right help for your family.